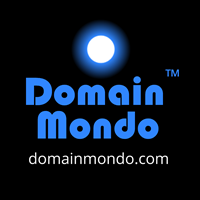 Domain Mondo's weekly internet domain news review (NR 2017-12-31 pdf) with analysis and opinion: Features • 1) 12 Questions for 2018: Domains, Internet Society (ISOC), Internet, ICANN, 2) ICANN news: Public Comments Closing in Jan 2018, 3) New gTLD Domains: $MMX, 4) ICYMI Internet Domain News - Reality Check: One World, One Internet, in 2017? 5) Most Read in 2017 & last week. 1. Domain Names: Will 2018 Be As Bad As 2017 or Worse, particularly for new gTLDs (new generic top-level domains)? Statistics at namestat.org are even more sobering. 2. Will the Internet Society (ISOC) find its way in 2018? The ISOC Feasibility Study | internetgovernance.org: "Since the completion of the IANA transition ISOC [Internet Society] seems rudderless." The Internet Society receives most of its revenue (pdf) from its affiliate Public Interest Registry (PIR), specifically, PIR.org’s operation of the legacy gTLD .org. But does Public Interest Registry operate in the public interest? Keeping Copyright Site-Blocking At Bay: 2017 In Review | Electronic Frontier Foundation | eff.org: "... This year, we’ve kept pressure on ICANN, the nonprofit body that makes domain name policy, to keep copyright enforcement out of their governing documents. And we’ve called out domain name registry companies who bypassed ICANN policy to create (or propose) their own private copyright enforcement machines. Public Interest Registry (PIR), the organization that manages the .org and .ngo top-level domains, announced in February that it intended to create a system of private arbitrators who would hear complaints of copyright infringement on websites. The arbitrators would wield the power to take away a website’s domain name, and possibly transfer it to the party who complained of infringement. The Domain Name Association (DNA), an industry trade association [started by Fadi Chehade and ICANN], also endorsed the plan. EFF pointed out that this plan was developed in secret, without input from Internet users, and that it would bypass many of the legal protections for website owners and users that U.S. courts have developed over the years. Within weeks [and only after being exposed by the EFF], PIR and DNA shelved this plan, apparently for good. Unfortunately, some domain registries continue to suspend domain names based on accusations from major motion picture distributors (whom they call “trusted notifiers”) ... these policies erode public trust in the domain name system, a key piece of Internet infrastructure ..."
"Whereas, the IANA Stewardship Coordination Group (ICG) included in its proposal that the intellectual property held by ICANN in relation to performing the IANA functions should be transferred to a neutral third party to hold for the benefit of the global Internet community, and licensed back to ICANN." The Internet Society is the organizational home of the IETF and supports it with funding; the IETF Trust was created by the Internet Society and the Corporation for National Research Initiatives. IANA: Trademark Status & Document Retrieval | uspto.gov: "Owner Name: IETF TRUST Composed of: Arkko, Jari, individual, Finland; Berger, Louis I., individual, United States; Brown, Kathryn C., individual, United States; Daigle, Leslie, individual, United States; Gondrom, Marc Tobias Daniel, individual, Germany; Levine, John, individual, United States; Pelletier, Raymond G., individual, United States; Schliesser,, Benson R., individual, United States; Sullivan, Andrew John, individual, United States; Owner Address: c\o INTERNET SOCIETY 1775 Wiehle Avenue, Suite 201, Reston, Virginia 20190." Trademark Electronic Search System (TESS) | uspto.gov: IANA "Registration Date September 17, 2002 ... Last Listed Owner IETF TRUST .... Assignment Recorded. Distinctiveness Limitation Statement in part, as to 'INTERNET ASSIGNED NUMBERS AUTHORITY.'" ISOC should have developed and have in place contingency plans for providing the IANA services when the global internet community replaces ICANN and/or its affiliate PTI (see Question 12. below). 3. What's Next for (U.S.) Internet Net Neutrality, in Congress, in the FCC / FTC and the federal courts--will the federal courts stop the FCC's attempt to do away with the Title II net neutrality rules? 4. Should the Internet Governance Forum be "allowed to die" (like the NetMundial Initiative)? 5. China's 5th World Internet Conference in 2018: Even Bigger, Broader, Bolder? 6. Will ICANN be ready for EU GDPR compliance on 25 May 2018? "We'll need to move quickly"--Goran Marby, ICANN President and CEO. "... we believe that compliance with the GDPR will have an impact on the WHOIS system, and thus the domain name space ... we need to work together to find the right balance between the current WHOIS services and compliance with local laws ..."--14 Nov 2017 Letter from ICANN (Akram Atallah & Theresa Swinehart) | ICANN.org (pdf) (emphasis added). More info: EU General Data Protection Regulation (GDPR) and ICANN WHOIS. WP29 (pdf): "... the unlimited publication of personal data of individual domain name holders raises serious concerns regarding the lawfulness of such practice under the current European Data Protection directive (95/46/EC), especially regarding the necessity to have a legitimate purpose and a legal ground for such processing. Determining whether (and to what extent) these concerns are justified is ultimately for the DPAs [Data Protection Authorities] to decide, although the primary responsibility for ensuring compliance with the law is with the data controller(s) ..."
Protection of personal data | European Commission | ec.europa.eu. The EU General Data Protection Regulation (GDPR) is the most important change in data privacy regulation in 20 years​." --EU GDPR | eugdpr.org. 7. Will NTIA extend the Cooperative Agreement with Verisign on or before November 30, 2018, and specifically, what will happen to .com pricing (long-term)? Will the U.S. government allow ICANN and Verisign exploit legacy gTLD .com registrants the way ICANN and Verisign already exploit legacy gTLD .net registrants? 8. Will ICANN "roll the root zone KSK" in 2018 or "break the internet" in the process? Root KSK Rollover Project | ICANN.org 18 Dec 2017: "The ICANN org is today announcing that it will not roll the root zone KSK in the first quarter of 2018. We have decided that we do not yet have enough information to set a specific date for the rollover." 9. What will be the outcomes of ICANN litigation in 2018? News Review Aug 20: Last Round of ICANN New gTLD .AFRICA Litigation? Any new litigation not yet filed (pdf). 10. What will the U.S. Department of Justice Antitrust Division do about .WEB, Verisign and ICANN? 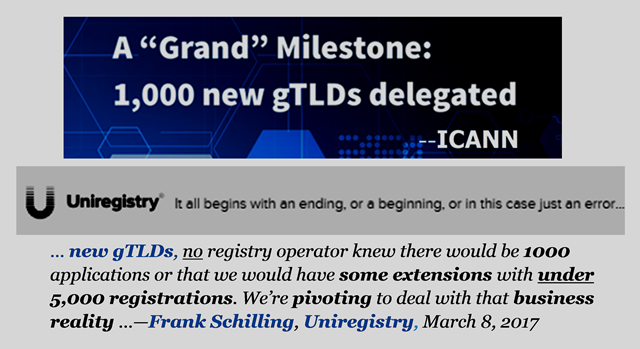 Editor's note: As I noted last week, ICANN mismanaged its ill-conceived and misbegotten expansion of gTLDs from just 22 to over 1200, rejecting the advice of the Federal Trade Commission (FTC) (pdf) and U.S. Department of Justice Antitrust Division (pdf) with regard to competition, pricing power, and consumer (registrant) protection. The above US DOJ letter was sent to ICANN by NTIA in Dec 2008 (pdf). "Item 7.01. Regulation FD Disclosure. See also: News Review | New gTLD .WEB, ICANN & Verisign, What's Next? 11. What will happen to the ICANN Reviews, including the still suspended SSR2 (by unilateral action of the ICANN Board of Directors on Oct 28, 2017, with AC/SOs leadership acquiescence)? Security, Stability, and Resiliency of the DNS (SSR2) (still suspended since Oct 28, 2017, by the ICANN Board of Directors and AC/SOs leadership. See also: News Review Dec 17: US Gov NTIA Rebukes ICANN Board and SSR2 mail list. 12. Will the global internet community begin taking steps to reform or replace ICANN in 2018, including at PP-18, ITU Plenipotentiary Conference 2018 | Dubai, UAE 29 Oct - 16 Nov 2018, or just establish a new, competing root? "The ITU has problems, but there is no other organization that includes most of the world. In particular, 14 out of 18 board members at ICANN come from the U.S. and allies. The majority of world Internet users aren't represented. This is unsustainable." --circleid.com (emphasis added). APC Priorities for the 12th Internet Governance Forum | Association for Progressive Communications: "being influential in ICANN requires a degree of effort and consistency which is difficult to sustain ... even in the IGF the fragility of the multistakeholder approach is evident as participation from governmental and business actors appears to be tailing off." A Closer Look at Why Russia Wants an Independent Internet | circleid.com: "the ICANN board in 2016. The Internet doesn't look like this anymore." Russia Will Build Its Own Internet Directory, Citing US Information Warfare | DefenseOne.com. "In 2014, the U.S. cleverly announced it would give control of the DNS database to a non-governmental international body of stakeholders, a process to be run by the California-based Internet Corporation of Assigned Names and Numbers, or ICANN. “Now, when China stands up and says, ‘We want a seat at the table of internet governance,’ the U.S. can say, ‘No. The internet should be stateless.’ They’re in a much stronger position to make that argument today than they were before,” Matthew Prince, co-founder of the company Cloudflare, told Defense One at the time. In a statement Tuesday, Kremlin spokesman Dmitri Peskov framed Russia’s desire for an alternative DNS as essential to “protecting it from possible external influence.” “We all know who the chief administrator of the global internet is. And due to its volatility, we have to think about how to ensure our national security,” Peskov said ... The move follows Russia’s 2016 launch of its own segregated military internet for top-secret communication, called the Closed Data Transfer Segment, modeled slightly after the U.S. Joint Worldwide Intelligence Communications System, or JWICS. (emphasis and links added). ICANN | Electronic Frontier Foundation | eff.org: "ICANN's susceptibility to capture has been no more evident than in the excessive deference given to the interests of intellectual property owners." Read also Why Did ICANN Become a Member of Trademark Lobbyist Group INTA? | DomainMondo.com Oct 15, 2015. Editor's note: remember, the global internet community, including domain name registrants, never chose ICANN, the U.S. government did. ICANN is a California corporate monopoly controlled primarily by the special interests mentioned above by EFF.org (gTLD registry operators and registry service providers, registrars, trademark lawyers, big tech (mostly U.S.) companies, and other special interests, lawyers, and lobbyists), who collectively are often referred to as the "ICANN community" which does not represent the global internet community and therefore is unable to reflect the global public interest. It should be a priority to reform or replace ICANN and its "ICANN community" with a more representative, balanced organization, with the ability to provide consumer (registrant) protections, and act as a competent and responsible steward of the global internet DNS, a global public resource, in accordance with the principles of RFC 1591. Still think new gTLDs are a great business opportunity? 4) ICYMI Internet Domain News - Reality Check: One World, One Internet, in 2017? • China closed more than 13,000 websites in past three years reports China's state news agency Xinhua: The Chinese government says all countries regulate the internet, and its rules are aimed at ensuring "national security and social stability" ... users themselves were punished for sharing sensitive news and commentary, with prison terms ranging from "five days to eleven years." --"These moves have a powerful deterrent effect," said Wang Shengjun, vice chairman of the Chinese parliament’s standing committee--usatoday.com. • Has the New York Times Made Gloria Steinem's Original 1998 Defense of Bill Clinton Disappear? | newsbusters.org: "... Steinem sent her feminist credentials into the toilet in March 1998 when, in a Times op-ed, she defended Bill Clinton against the charges which eventually led to his impeachment later that year. The link to that op-ed in the previous paragraph was found in a public library database. That's because I couldn't locate it in multiple searches at the Times website ..."
• How Facebook's Secret Unit Created Digital Propaganda Troll Armies To Influence Elections | ZeroHedge.com: "how a secret unit of Facebook has helped create troll armies for governments around the world including India for digital propaganda to influence elections." Tech Review (TR 2017-12-30)--Domain Mondo's weekly review of tech news with commentary, analysis and opinion: Features • 1) The Big Issues Affecting Tech and Global Economy 2018: China, U.S., Brexit, EU, and the ECB, 2) Investing: The Week, Investing Notes, 3) ICYMI Tech News. But don't expect any changes in Chinese censorship and other policies that favor Chinese companies over foreign competition, require foreign companies to have local Chinese "partners" and mandate the disclosure of proprietary intellectual property so it can be co-opted by the government and Chinese competitors. China, thus far, has made a mockery (pdf) of WTO rules and fair free trade, and the EU and prior U.S. administrations did almost nothing about it. At least the Trump administration has brought it forward as an issue that must be dealt with. What I can tell you is that outside the media circus centered in Washington D.C., and its echo chambers in New York and Hollywood, no one is waiting "with bated breath" for Hillary to become President in 2020, or Chuck Schumer to become Senate Majority Leader, and most voters in Alabama voted against (50.1%) or reluctantly for Doug Jones. For the long view, the Brits and Michael Moore have probably got it right--Trump is headed for re-election in 2020. My recommendation: ignore the noise and misinformation, the tax reform bill and repatriation of billions of dollars now offshore should be a boost for the U.S. economy and tech industry in 2018.
c) Brexit, EU, and the ECB (European Central Bank): It's all a mess, and most of it will still be a mess a year from now--the fundamental flaws in the euro currency (pdf) and ECB policy (interest rates too low for too long), the dysfunctional EU (and I'll just leave it at that for now), and the messy divorce called Brexit (divorces do tend to be messy, and expensive). Where the media gets it so wrong: the EU, specifically, Germany, has the most to lose, not the UK. Theresa May's objective should be to cut the best deal she can and get out quick, rather than be dragged down by maintaining ties to EU institutions and rules which the UK cannot control. Trump is ready right now to do a free trade deal with the UK, possibly including Canada and Norway, after Trump kills NAFTA outright, or essentially by renegotiating its terms. Goldman Sachs denies moving operations from London to Dublin | CBSnews.com Dec 27, 2017: "As part of our Brexit planning we are considering options related to elements of fund administration within the EU," she said, emphasizing that changes to headcount would be small. The Financial Times reported earlier on Wednesday that Goldman would move its European asset management business, with about 20 employees, to Dublin. Whatever the outcome, the hoped for windfall from the City of London financial centre to Frankfurt, Paris, Luxembourg, Dublin, or elsewhere within the EU, will be disappointing, to say the least. The Week: U.S. Markets ended the week slightly down as investors closed their books for the year, and what a year it was--U.S. stocks mount milestone-shattering run in 2017: S&P 500 index gained 19.4 percent while Dow rose 25.1 percent | richmond.com. The Quants Run Wall Street Now | WSJ.com: "For decades, investors imagined a time when data-driven traders would dominate financial markets. That day has arrived." Howard Marks: "There are old investors, and there are bold investors, but there are no old bold investors." Valuing Amazon.com, Inc. (NASDAQ:AMZN) | SeekingAlpha.com: Amazon does not defy laws of value investing. India: "Young Indians are hooked to Facebook, Instagram, and YouTube. But for older Indians, WhatsApp is the ultimate social network." --WhatsApp has become the de facto social network for older users in India, where the app has more than 200M users--buzzfeed.com. But note "a secret unit of Facebook has helped create troll armies for governments around the world including India for digital propaganda to influence elections."--ZeroHedge.com. Apple, Epson face French legal complaints over allegedly shortening life of products--reuters.com and Apple faces lawsuits after saying it slows down aging iPhones--reuters.com. Apple, suppliers drop on report of weak iPhone X demand--reuters.com. Wishing You a Happy New Year and Prosperous 2018! Predictions made in 2017 for 2020: L2inc.com's Scott Galloway predictions re: AMAZON.com, Inc. $AMZN, catching up to Netflix with original content, producing more innovative hardware than Apple, and about to lead the biggest consumer sector in the world--Amazon $AMZN: (1) this company will hit a $1 trillion market cap by 2020, and (2) thereafter broken up. (0:45) Yahoo! Finance, June 2016. 0:02 A winner: Amazon and their acquisition of Whole Foods for $13.5 billion. 0:08 We don't like to gloat, but here are our predictions around the acquisition. 0:18 Okay, so we like to gloat a little. 0:25 a genius acquisition that gives them an unbelievable growth vehicle. 0:28 Amazon in our view is going to be the first trillion-dollar market capitalization company. 0:40 and bid up their stock more than the value of the acquisition price. 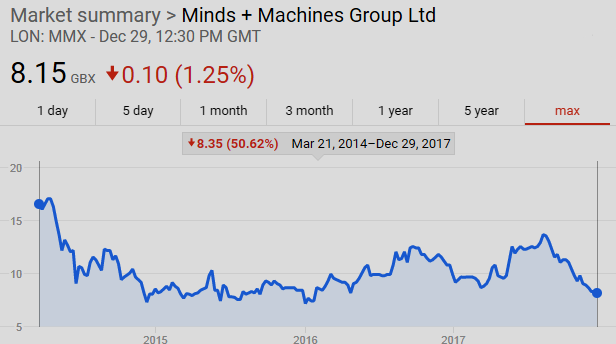 0:49 as their value was taken down the day that deal was announced. 1:01 and Amazon is about to become the fastest-growing $1 billion-plus grocer. 1:06 The markets are going to love that. 1:08 Just one and a half percent of fast moving consumer goods sales in the US occur online. 1:13 Even in South Korea, that enjoys the greatest global penetration, at just 16%, shy of the 20% tipping point that really causes disruption in the sector. 1:23 Who's the big winner here besides Amazon? 1:26 Have you ever wanted to shop at Whole Foods but it was just too damn expensive? 1:29 Well, your prayers have been answered. 1:36 bring down prices and also put in place their hurdle rates for profitability i.e. zero. 1:42 As a result we're about to get a Mercedes for the price of Toyota. 1:46 Whole Foods is about to become in a word, awesome. 1:51 And who's the most dominant company on the second most important screen in the world, your television? 1:56 Netflix, but for how long? 1:57 They've increased their original content budget to $6 billion only because Amazon's feet they can hear behind them. 2:09 and they're going to get sports, they're already streaming some NFL games. 2:21 or broadcast TV is going to register when they no longer have sports as their firewall of viewership erosion. 2:28 And who's the most innovative hardware company in the world? 2:31 Yes it's still Apple, but for how long? 2:33 The most innovative hardware products of 2016 to 2017? 2:37 The Apple Watch? The AirPods? 2:41 Oh and who happens to be the most dominant company in the fastest-growing tech sector, the cloud? 2:47 Amazon. By 2020 Amazon will be our first trillion-dollar market cap company. 3:03 as we begin to connect the dots and realize this amazing company is destroying jobs faster than we can recreate them. 3:09 2020, a trillion dollars and the end of Amazon as we know it. Video above originally published Jul 13, 2017 by L2inc.com. Vox video above published Aug 25, 2017: Venezuela is in chaos, but its leaders aren't going anywhere. Discussion of currency issues begins about 4:30. [Correction at 1:58: the Supreme Court tried to strip the country’s National Assembly of its powers in March 2017 (not 2016)]. After a decade and a half of strict exchange controls in Venezuela, access to U.S. dollars has been severely limited. Nonetheless, a black market in the world's foremost hard currency has spread in response. Venezuela's oil revenues have declined due to mismanagement and the decline in the price of oil on the world markets. Venezuela’s economy is now in free-fall, a living laboratory of whether Bitcoin or any other cryptocurrency could fulfill the needs of the market and economy. In fact, Venezuela has a plan to introduce its own cryptocurrency. In fact, several countries use the U.S. dollar as their official currency, and in many others it is the de facto currency. Cryptocurrency: "a digital currency in which encryption techniques are used to regulate the generation of units of currency and verify the transfer of funds, operating independently of a central bank." Hard currency: "currency that is not likely to depreciate suddenly or to fluctuate greatly in value." Bitcoin and other "cryptocurrencies" are not "hard currency." The U.S. dollar is the world's foremost "hard currency." Fiat money: "inconvertible paper money made legal tender by a government decree." Fiat (by government decree) currency was introduced as an alternative to commodity money and representative money. Commodity money is "created from a good, often a precious metal such as gold or silver, which has uses other than as a medium of exchange (such a good is called a commodity). Representative money is similar to fiat money, but it represents a claim on a commodity (which can be redeemed to a greater or lesser extent)." The circulating paper money of the U.S. consists of Federal Reserve Notes that are denominated only in United States dollars (12 U.S.C. § 418). Federal Reserve Notes are the only type of U.S. banknote currently produced. Federal Reserve Notes are authorized by Section 16 of the Federal Reserve Act of 1913 and are issued to the Federal Reserve Banks at the discretion of the Board of Governors of the Federal Reserve System. The notes are then put into circulation by the Federal Reserve Banks, at which point they become liabilities of the Federal Reserve Banks and obligations of the United States. Federal Reserve Notes are legal tender, with the words "this note is legal tender for all debts, public and private" printed on each note. They have replaced United States Notes, which were once issued by the Treasury Department. Federal Reserve notes are backed by the assets of the Federal Reserve Banks, which serve as collateral under Section 16. Total assets of the U.S. Federal Reserve Banks as of Dec 20, 2017, were almost $4.5 trillion. There were approximately $1.55 trillion in Federal Reserve notes in circulation as of November 15, 2017. Pictures of the year: U.S. Treasury Secretary Steven Mnuchin @stevenmnuchin1 and his wife, Louise Linton @LouiseLinton, hold a 2017 50 subject uncut sheet of $1 dollar notes bearing Mnuchin's name at the U.S. Bureau of Engraving and Printing. Why is the U.S. dollar in such demand in Venezuela? U.S. dollars are easily exchanged for any other foreign currency and the U.S. dollar does not fluctuate greatly in value against a basket of other hard currencies. U.S. is still the world's largest economy, with the world's largest military. The Great Forking Bitcoins of China | circleid.com: "... Since a large fraction of the [bitcoin] miners are inside China, and all of the hard currency exchanges are outside [China], this will cause a pretty serious fork ... If some of the disappeared transactions were yours, how would this affect your opinion on Bitcoins?" For other reasons why cryptocurrency is inferior to any "hard currency," begin by reading this. Lesson: if you want to speculate or "gamble" in Bitcoin or other cryptocurrencies, do not do so under the delusion that any cryptocurrency outside the world's central banking system, will replace the U.S. dollar, or any other "hard currency," in the foreseeable future. CNBC.com video above published Dec 26, 2017: CNBC's Seema Mody reports on bitcoin. WorldRemit video above published Dec 5, 2017. WorldRemit (domain: worldremit.com) is an online money transfer service that provides international remittance services to expatriates and migrant workers. The company was founded in 2010 by Ismail Ahmed and is backed by venture capital companies Accel Partners (Domain: accel.com) and Technology Crossover Ventures (TCV) (domain: tcv.com). CNBC.com video above published Dec 22, 2017: Bitcoin's skyrocketing stocks push cryptocurrency mania — and scams — to new highs, but FINRA's guidelines could help investors avoid getting duped. Israel regulator seeks to ban bitcoin and other cryptocurrency firms from trading on the Tel Aviv Stock Exchange | reuters.com. Belarus adopts crypto-currency law to woo foreign investors | reuters.com, law also allows local IT companies to operate in part under English law, a provision meant to attract potential foreign investors. Be suspicious of anyone who guarantees that an investment will perform a certain way, or makes pushy sales pitches that encourage you to “act now.” If you think the claims might be exaggerated or misleading, contact the SEC, file a complaint using FINRA’s online Complaint Center or send a tip to FINRA's Office of the Whistleblower. Do not say "yes" to cryptocurrency stock purchases from an aggressive cold caller, particularly if the recommended stocks are very low-priced. Not answering at all, or putting down the phone, are generally the safest responses to a cold caller or anyone aggressively pitching low-priced stocks or other investment opportunities. Use FINRA BrokerCheck® to check the professional background of the individuals involved in selling the investment, as well as the firms who tout these opportunities. Selling securities generally requires a license and registrations under state and federal securities laws and FINRA rules. Check the SEC's EDGAR database to find out whether the company files with the SEC. If so, read the reports and verify any information you have heard about the company. But remember, the fact that a company that has registered its securities or filed reports with the SEC doesn't mean it will be a good investment. Be wary of stocks with huge spikes in price. Steep run-ups in price could signal potential manipulation or fraud. Know where the stock trades and pay attention to any cautions associated with the stock. Most stock pump-and-dump schemes tend to be quoted on an over-the-counter (OTC) quotation platform like OTC Markets, which provides icons to warn investors of concerns associated with a given company. These include a stop sign or skull and crossbones to warn of questionable practices. "Investors can obtain more information about, and the disciplinary record of, any FINRA-registered broker or brokerage firm by using FINRA's BrokerCheck or by calling (800) 289-9999. In 2016, members of the public used this free service to conduct 111 million reviews of broker or firm records. Investors can also call FINRA's Securities Helpline for Seniors at (844) 57-HELPS for assistance with concerns or questions about their brokerage accounts and investments ..."
In the U.S., the Financial Industry Regulatory Authority, Inc. (FINRA) (domain: finra.org) is a private corporation that acts as a self-regulatory organization (SRO). FINRA is the successor to the National Association of Securities Dealers, Inc. (NASD) and the member regulation, enforcement and arbitration operations of the New York Stock Exchange. It is a non-governmental organization that regulates member brokerage firms and exchange markets. The government agency which acts as the ultimate regulator of the securities industry, including FINRA, is the Securities and Exchange Commission (Domain: SEC.gov). Similarly, the Commodity Futures Trading Commission (CFTC) is the U.S. financial regulatory agency tasked with overseeing the U.S. derivatives markets (domain: cftc.gov). Read the CFTC Statement on Self-Certification of Bitcoin Products by CME (cmegroup.com), CFE (cfe.cboe.com), and Cantor Exchange (cantorexchange.com). "December 1, 2017 The purpose of this investor advisory is to remind investors that, just like any other speculative investment, trading futures on virtual currencies, including Bitcoin, have certain benefits and various risks. While futures on virtual currencies must be traded on regulated futures exchanges, trading these products involves a high level of risk and may not be suitable for all investors. It is critical, therefore, for investors who are considering trading virtual currency futures to educate themselves about these products, understand their risks, and conduct due diligence before making investment decisions. Investor protection begins with investor education ...." (read more at link above). Vipshop (domain: vip.com) is a Chinese company that operates the e-commerce website VIP.com (formerly Vipshop.com) specializing in online discount sales. Vipshop is based out of Guangzhou, Guangdong, China, and was listed on New York Stock Exchange (NYSE: VIPS) on March 23rd, 2012. As of 2017, Vipshop had 52.1 million customers. Vip.com is now the third largest e-commerce site in China, following Tmall.com (Alibaba Group) and JD.com, according to Wikipedia.org. #Tencent and #JD.com announced on Mon that they will invest an aggregate of $863mln in cash in Chinese online discount retailer #Vipshop, making their holdings to 7% and 5.5% respectively. The price represents 55% premium over closing price of Vipshop's ADSs as of last Friday.